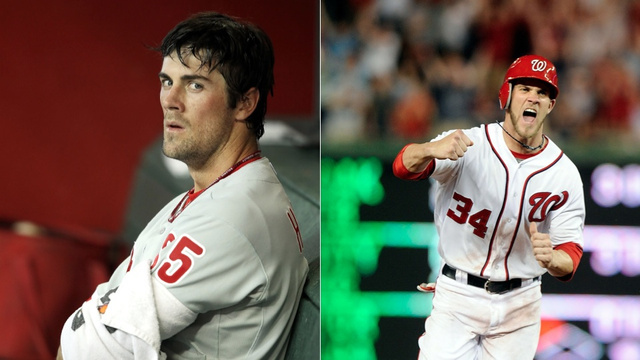 Phillies pitcher Cole Hamels, left, admitted after a game on Sunday that he intentionally hit Nats’ rookie Bryce Harper. Seriously? Grow up and play the game you get millions of dollars to play. That five game suspension you got is fitting for your idiocy. McGILLIGAN: Cole Hamels is a 28-year-old major league pitcher. Bryce Harper is a 19-year-old up-and-coming player. That’s where this story should have ended. Unfortunately it didn’t. We ended up watching the 28-year-old act much less mature than the 19-year-old and chalking it up to some ridiculous baseball code. Hamels admitted to intentionally beaning Harper in the first inning of the Philadelphia Phillies 9-3 win Sunday against the Washington Nationals. Hamels is wrong, in my opinion, for a number of reasons. You want to make a point to a rookie? Strike him out. Don’t throw at him and pretend you’re protecting the reputation of the game – you’re not. The fact that Harper stole home that same inning is priceless. Do pitchers like it when a kid comes to the big leagues, has immediate success and is excited about it? No, but it doesn’t mean you intentionally throw at some one. And don’t hide behind some ancient code. If that pitch slipped a bit out of Hamels hand and hit Harper in the head causing a concussion, we’re having a very different conversation and I bet Hamels doesn’t admit to it. As for the conspiracy theory of the league protecting certain players, that doesn’t even make sense. How is the league protecting Harper? He’s a 19-year-old kid facing major league pitching; the fact that he’s handling it like a veteran is a testament to his skills and quick development. Did the league tell other pitchers to groove fastballs to Harper or instruct umpires to adjust their strike zones for him? I’m sure MLB did not. So if Hamels wants to be old school and protect the prestigious way of baseball, here’s my suggestion: Shut up and play. LIVINGSTONE note: As I posted this piece, Hamels was handed down a five game suspension for intentionally throwing at Harper. In my own words: Good. What an idiot.